Growing up in South Africa, Gunter comes from a family of sailors. He started sailing at the age of 6 in Optimists, and progressed through the ranks to Keelboats. Gunter joined the South African Navy as a Diver in 1991 and quickly become a Dive Supervisor. Sailing competitively on large boats all around the Southern tip of Africa, he solidified his love of sailing. Gunter earned his USCG Capt license, is a US Sailing Certified Keelboat instructor and is a Level 3 Coastal Kayaking Instructor. After 20+ years of managing outdoor adventure events, running teambuilding programs and guiding tours, he is as comfortable teaching kids in a summer program, as he is presenting to upper management at a corporate event. Gunter’s passion for teaching sailing and promoting safe water sports led him to certifications with US Sailing and The American Canoe Association, the best sanctioning bodies for water sports in the US. When not on the water Gunter is an avid mountain biker and is hiking, biking or skiing with his wife and two daughters. 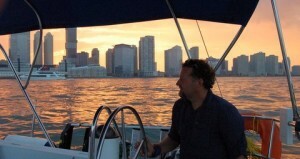 US Sailing’s Basic Keelboat Course : The course will span 24 hours in total. What to expect and how to prepare for the course in order to help you to be as successful as possible. The classroom component will be conducted in the Woodenboat school building at Hudson River Maritime Museum. We will meet in the classroom each day. We will start promptly at 9:00 AM and we will be finished at approximately 2:00 PM pm each day (All end times are weather dependent). There is always the chance that you and your equipment can get wet, or fall in the water. Please plan accordingly with the clothes you bring and with your electronic devices. The Catalina 27 keelboat we use is a basic tiller steered keelboat. They have the required safety equipment on board including USCG approved PFD’s ( Life Jackets) if you choose to you may bring your own approved Type 3 pfd. Persons over 14 years old are not required to wear a PFD at all times, but there must be one on-board for each person. The boats also have a small cabin where your equipment will be stored. This space in NOT guaranteed to stay dry. Close toed shoes or boating shoes. Waterproof or foul weather gear- Jacket and pants if you have. Lunch and Snacks (we will be done at 2pm daily, and you can grab lunch at Olde Savannas restaurant once we have completed the days training. A waterproof case is recommended if you need to bring your electronics along. I am looking forward to sailing with you. If you have any questions or concerns please feel free to contact me by phone or e-mail. I consider it my duty to facilitate your success in this course. If there is anything that I can do that will help your performance or understanding, please do not hesitate to ask.